Being a high-profile specialist, Vicon offers dedicated products and services within forage harvesting equipment, seeding systems, fertiliser spreaders and sprayers. In the past 100 years the Vicon brand has introduced a constant stream of groundbreaking innovations and has a proud history of being first on the market with new concepts. Since the world wide success of early innovations like the ”finger wheel” rake and pendulum type fertilizer spreader, the distinctive Vicon logo has been known as a quality brand embracing a wide range of high performance equipment. 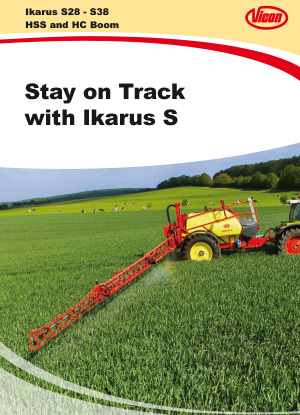 The Vicon Ikarus S trailed sprayer is available in 2800 or 3800 litre tank capacity with HSS 18-30 metre horizontal folding steel booms or with HC 18-30m vertical folding steel booms. The EasySet control panel makes life easy by its intuitive operation. 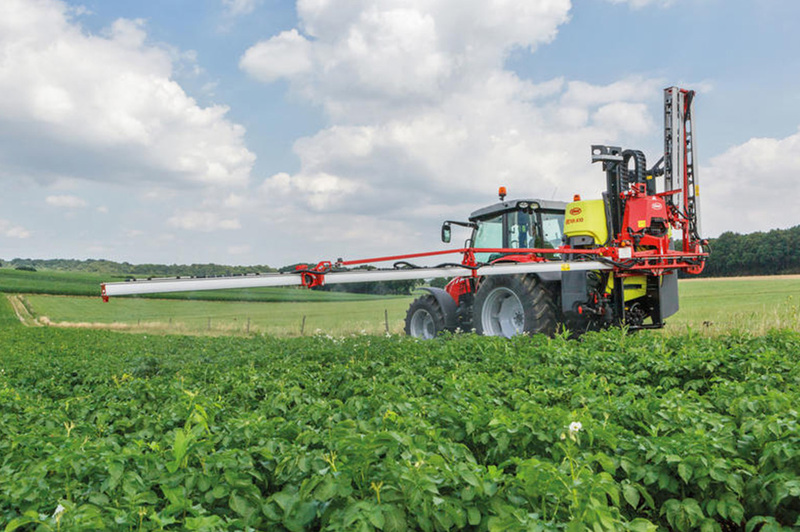 The Vicon iXtrack A trailed sprayer is available in 2400 or 2800 litre tank capacity with HSS 18-30 metre horizontal folding steel booms. Tank volumes of 2400, 2800 and 3600 litres are available on iXtrack B in combination with HSS 18-36 metre steel booms or HSA 24-33 metres high tech aluminium spray booms. 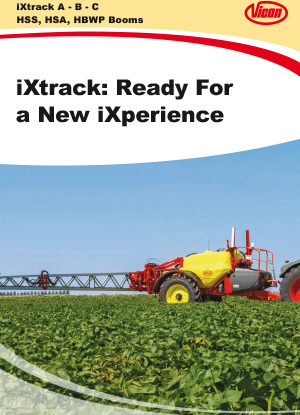 The Vicon iXtrack sprayer range is developed with big focus on operator comfort and environmental protection. The iXtrack C offers tank volumes of 3000, 4000 and 5000 litres in combination with HSS 18-40 metre steel booms (18-30m 2-part folded and 27-40m 3-part folded) or HSA 24-33 metre aluminium booms. The third available boom is the HBWP with 45 metre boom width. It has a low centre of gravity and compact dimensions for higher working speeds and easy transportation on the road. 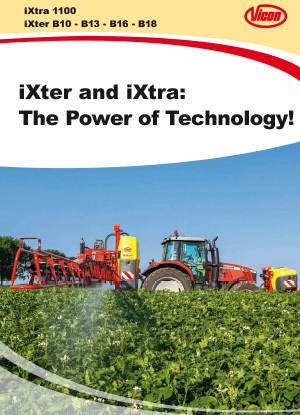 The iXter A mounted sprayer provides options with tank volumes of 800, 1000 and 1200 litres. There are two different boom types available; the HOSA (12 and 15 metres) and HC (18, 20 and 21 metres). 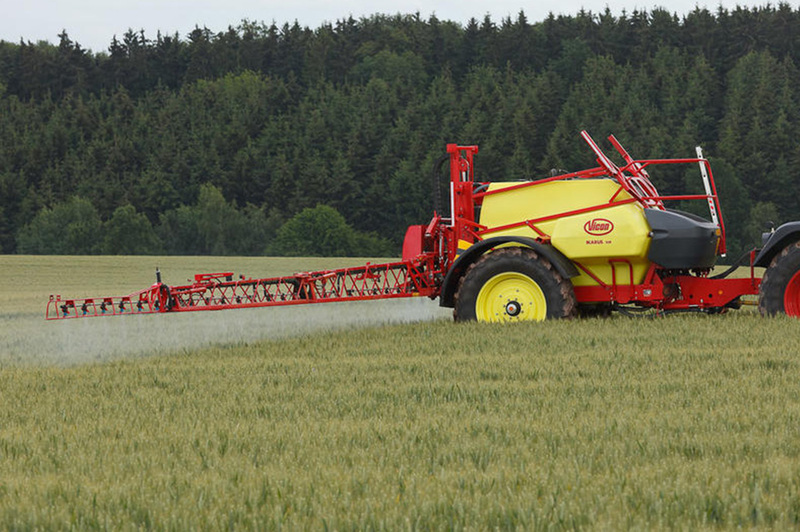 The iXter B Mounted sprayer range has tank volumes from 1000 up to 1800 litres. Different boom types available from 15 – 30 metres. Finally the additional iXtra front tank offers a volume of 1100 litres. In combination with the iXter mounted sprayer, the iXtra front tank provides a total volume of around 3000 litres.